He was born on January 22, 1921 in the small town of Tisovec. He studied at the grammar school in Banská Bystrica where his drawing teacher Krákora took notice of him and recommended him for further studies. Then he attended the Slovak Technical University in Bratislava, the Department of Drawing and Painting where such personalities as Ján Mudroch, Gustáv Mallý and Martin Benka taught him. After finishing university studies he acted as a drawing and descriptive geometry teacher at the grammar school in Martin. He used to tell his students about his faith. Eventually, he was arrested for his religious activities. Though there was given no accusation or judgement in his case, he was sentenced to seven years of imprisonment. He experienced interrogation, intimidation, demanding prison conditions and threatening, too. He spent five months in solitary cell where he wrote thirty poems depicting his feelings and talks to God. It is a kind of his chronicle from prison. After serving a half of his sentence, he was paroled. Every event that had touched him somehow later appeared in his work. He has always believed in God, so his work was often influenced by the gospel. 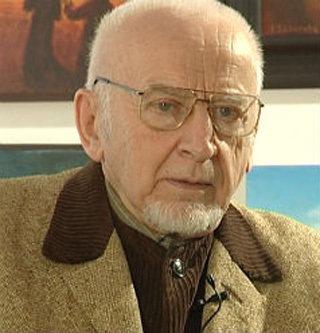 In 1958 he created one of his most famous paintings called “Snímanie Krista z kríža” (Descent from the Cross) which symbolized his coming back from the “cross”, actually from prison. However, when he was finally released, he was affected by the consequences of persecution; he wasn’t able to get involved in society and his employment opportunities were minimal, thus he illustrated books for children and applied his mind to landscape painting. During the period of normalization he decorated 25 churches with the Stations of the Cross. Between years 1968 and 1969 he lived in France with his family and studied sacral art – architecture and interior decoration of churches. His mission in life is to spread joy, Christian optimism and religious belief in eternal life. Thus his work belongs to that kind of art which has its profundity and carries certain message. “Well, they gave me those duds, so nothing was mine, neither name, just a number. He conducted my investigation. And it was really hard because he let me sit under an open window for the whole day. Furthermore, it was in January, he was wearing ushanka and fur coat, drinking hot tea and he even went somewhere to warm up and left me sitting there under the window. It was a miracle that I didn’t fall ill. And when they found out nothing, you know, they used various scare tactics, as I didn’t reveal anything what could be taken as a high treason because actually I hadn’t committed anything like that, they wrote five pages of a really severe protocol and if I hadn’t signed it, they would have slain my wife. We had five children, so I had no choice but to sign. When I did it, they left me in the solitary cell for another five months and told me: ‘Well, you will be given at least twenty years or the rope!’ And they though I would go mad there. The story and videoclips of this witness were put together and published thanks to the financial support of EU within the programme Europe for Citizens – Active European Remembrance.